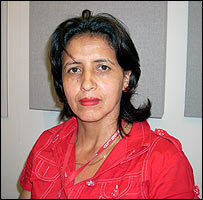 Honduran journalist Dina Meza has won the 2007 Amnesty International Special Award for Human Rights Journalism Under Threat. A lawyer for her online magazine Revistazo, which has investigated abuses by the country's burgeoning private security companies, was shot dead in December 2006 in a crime which remains unsolved. In the Middle East, the war is obvious. We can see the physical destruction of buildings and deaths of people. But in Latin America, the war is different: it is one waged against poverty, hunger and a violence rooted in corruption which targets people who express their own ideas. It is a silent war against the impunity of recent years. It is a fight for a fair society. Corrupt legal systems, corrupted media and impunity for the torturers and killers of the 1980s are phenomena to be found across Latin America. Journalists here only have two options: you are either for or against the oppressed. If we can get into the shoes of those who are suffering, we will feel their pain and will be moved to do something. My colleagues and I created Revistazo because we could not publish our stories about human rights abuses anywhere else. As a website, we aim to impact on decision-makers in Honduras and give the people whose interests we defend a hearing. One area we have been investigating particularly is the private security companies which appeared in Honduras after the Cold War of the 1980s when our country was nicknamed the "backyard of the USA". They were mainly formed by landowners and people who had violated human rights during the war, and who suddenly found themselves without the protection of the army. There are more than 350 such companies in Honduras. They employ seven times more people than the whole of the national police force. They are overflowing with weapons and the state has little control over them. It is very easy to violate the human rights of their employees who typically have very little education and come from very small villages. They often have to work around the clock for no extra pay and without holidays. They have to buy their own uniforms and can have their pay docked for no reason. They are given weapons in very poor condition and have to pay for any bullets they fire. We decided to take up their case because nobody else was fighting for their rights. Since last year staff on the magazine have been threatened more and more. We have had our telephones bugged and we and our families have been followed in the street. Threats get posted in the comments section of our website. Once I got a message telling me that my teenage daughter was "very good-looking". It is not easy to say who is behind this harassment. We also investigate the pay of senior civil servants and we also cover the rights of workers in the fast-food industry. Our lawyer, Dionisio Diaz Garcia, was murdered on 4 December. All seven of us have been assigned one police bodyguard each but they are effectively only there during office hours. We also have to pay for their meals and travel expenses though that should be the state's responsibility. Even then, we do not know if we are really safe because the security companies have a lot of influence within the police. We want the state to protect us properly and to find the murderers of our lawyer. One state official privately offered me plane tickets to leave Honduras but I said I could not because I needed to continue my work. He was asking me to stop our investigation of the murder because of a "clash of interests". I asked what these interests were and he said he did not want to go into it and that he would give me no more information. When I recently asked the same official what progress had been made to solve the murder, he got quite annoyed and told me he was going to take no further action regarding our problem. When you get a reply like that from the state, all you can do is put your faith in God and go on working. I compare the risk my family and I now run with the legacy which I would leave my children by giving up. I would leave them a corrupt society with a lot of injustice. It is just not worth it. My children know what I do and they know the risk we run. They also trust in God and know that He is protecting us. So no, I won't give up.